Customers allows techs to group Devices together by business name or a group name easily and quickly add new devices to them. Check out the Kabuto documentation for more information. Devices were analyzed and grouped based on similarities of company name and device name. If either of these were found to be similar, they were grouped and assigned as either an Individual or Company which are designated by a house or building respectively. Devices that didn’t have any similarity were paired under one customer called “Default Customer”. A device must have an associated Customer. 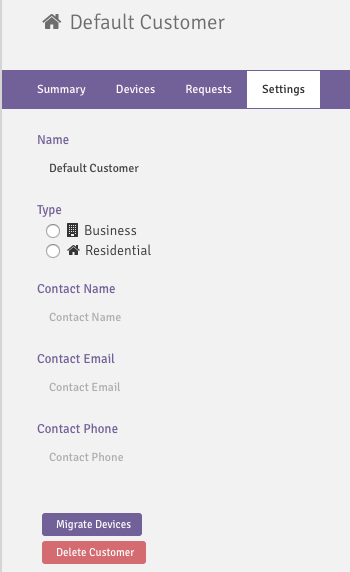 As a tech, you should look through your newly created Customers and rename or change type if necessary. Devices might need to be migrated from one Customer to another. To do so, look for the new horizontal arrow icon and select the appropriate Customer. This can be performed as a bulk action from the Devices page. Additionally, if a Customer doesn’t need to exist the Devices need to belong to another Customer, we’ve built a specific action for this. Head to the Customer’s settings page and select “Migrate Devices” or “Delete Customer”. Delete the Customer if it doesn’t need to exist, Migrate if the Customer needs to exist but should be emptied for now.